"This is not a garden for gardeners. It's a garden for painters." Years ago my mother had a reproduction Louis XVI chair I coveted. She finally got tired of it and gave it to me. It was at this time that I became aware of the Bloomsbury Group and The Omega Workshops. The World of Interiors published a story that same year, about Charleston. The Laura Ashley Company had reproduced some of the fabric designed by Vanessa Bell and Duncan Grant for Charleston. 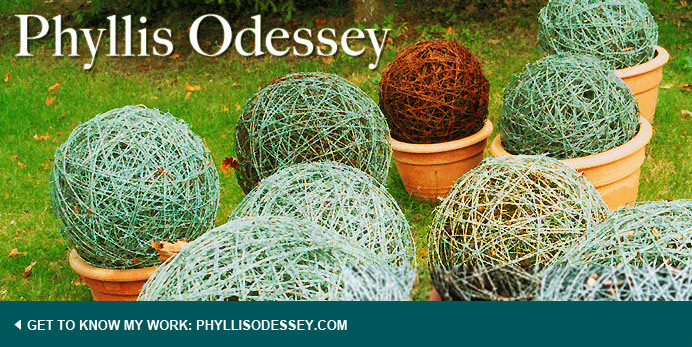 I bought a yard or two for my French chair. A week ago, I went to Charleston, home of Vanessa Bell and Duncan Grant and others. In the first room of the relatively modest farmhouse, were two antique French chairs covered in the same fabric as my reproduction French chair. 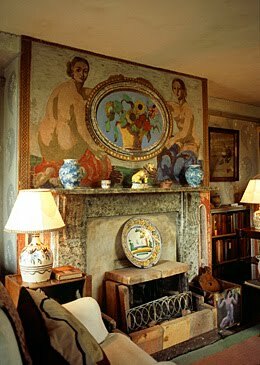 Vanessa Bell and Duncan Grant decorated their house by painting the walls, tables, fireplaces, trunks, bookshelves, desks, headboards and any other object they could get their hands on. They also designed fabric and reupholstered their furniture in their own designs. They collected interesting ceramics and their son Quentin Bell, a potter, created many of the light fixtures, tiles, bowls and dishes in the house. 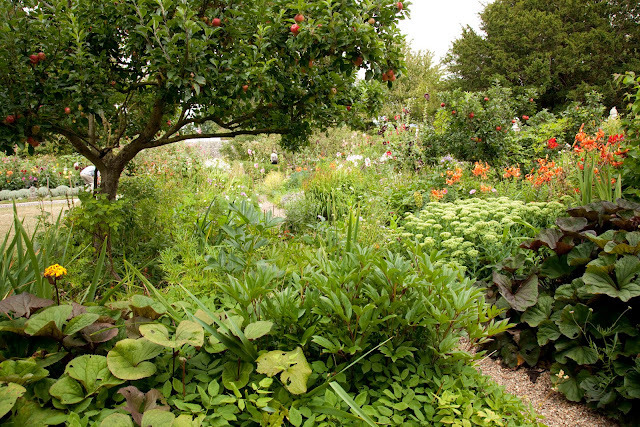 The garden is an extension of their aesthetic. It is a garden for painters. 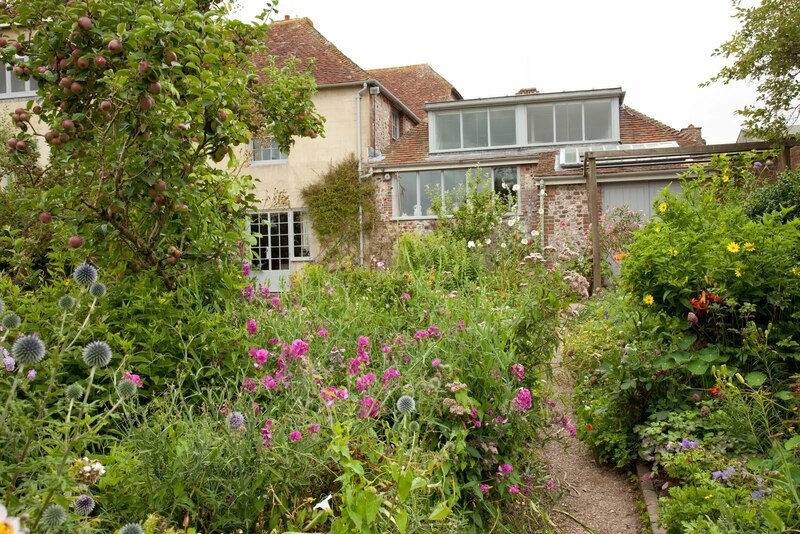 Both Vanessa Bell and Duncan Grant, their friends and family (including Virginia Woolf and Robert Fry) spent a great deal of time in the garden, reading and painting. The garden is small, similar to what a large American backyard might be. It's all about color. 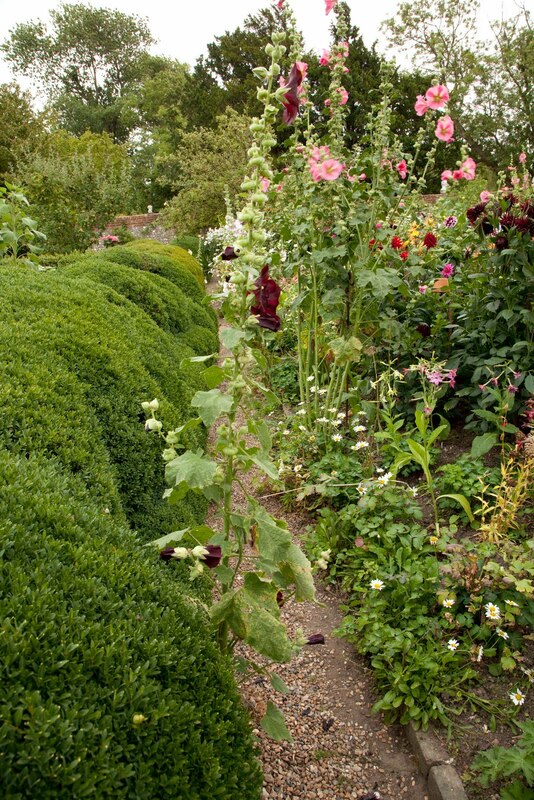 Exuberant, "untidy" and a reminder that gardens can be UNdesigned and wonderful at the same time. All photographs of the garden copyright Peter Mauss. No usage without permission. Phyllis! I arrived at this house minutes after it closed -- and never got to see it, alas. I know you loved it -- love, paula ps just sold house. I find Vanessa Bell and Duncan Grant utterly fascinating and have read as many books about their life together as I've been able to! Thanks for the lovely review and the wonderful picture of the over-mantel. But: her son! Grant and Bell had a daughter together, (writer and painter) Angelica Garnett, but Quentin was Clive Bell's son.